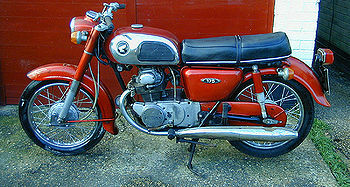 The Honda CD175 was a 174 cc bike introduced in USA, Canada, UK, Africa, Asia, Australia and New Zealand in 1967. Main features of this bike included 360 degree cranks, a single ignition, single carburetor to cut down maintenance, odd styling, a parallel twin high revving engine and a speedometer that calibrated to 100 mph (160 km/h). Claimed Top speed was 80 mph (128 km/h) but with a light rider and no head wind it could go faster (people claim to have done 100 mph or 160 km/h which was the maximum calibration on the speedometer). The big end had rollers to ensure a smooth ride at high revs. They shared their engines with the equivalent years CB175 sport bikes & CL175 scramblers. There were 2 main versions of the bike - the CD175 & CD175A made from 1967-1969, and the later CD175 K3 & K4, (or T3 & T4, or A3 & A4, depending on the country of sale) from 1969 to 1979. In addition, in some countries the electric starter was deleted to reduce the price. The early bikes ('67-'69) featured a pressed steel spine frame (Honda called this a 'T-bone' frame in some advertising), and an engine with heavily forward-inclined cylinders that acted as a stressed member - there was no down tube as in a cradle-framed bike. In this regard they were similar to the earlier C72/C77 and C92/C95 bikes. The later bikes - '69-'79 - were far more conventional, with upright cylinders and a conventional tubular frame with down-tube in front of the engine. They were heavier and not as fast as the early bikes. Depending on the market, they were fitted with dual seats, or single seats with large luggage racks. This bike offered a relatively quicker ride compared to a cheaper cost (50 miles per gallon) but suffered from weak brakes (being only cable operated single shoe drum brakes) and was not “oil tight”. Also the 6 volt electric system made the lights quite inadequate at any speed over 30 mph on a dark night. In 1979 this model was replaced by Honda CD185. This page was last edited on 20 January 2011, at 23:32.